Intrinsically safe telephone iVT3** Description The intrinsically safe telephone iVT3** is designed in the I M1 EEx ia I category / type of protection and may be used unconditionally in intrinsically safe telephone systems of Type 5210/3 or alarm telephone systems of Type TA1 (approved telephone systems from FHF Bergbautechnik) in explosive atmospheres in the mining industry. The associated converter (Type 2313, sG2148, sB2248, iKT1-A2, KT1) separates the intrinsically safe part of the telephone system securely from the non-intrinsically safe telephone network. 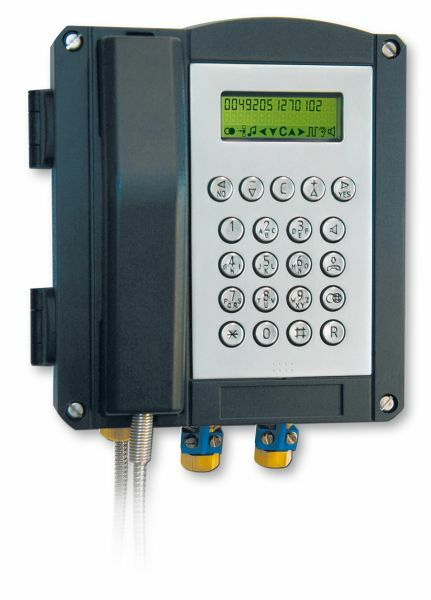 The intrinsically safe telephone iVT3** only works with the abovementioned converters and is not fit for direct connection to private branches or public telephone networks! The designated power supply is primary batteries as local battery (battery module Type 9704U6) or the use of NiCd rechargeable batteries (rechargeable battery module Type 9704U8) with a local supply. When locally feeding the NiCd rechargeable batteries through an intrinsically safe power supply unit Type NG3-12ib, the supply voltage is buffered through a NiCd rechargeable battery (rechargeable battery module Type 9704U8) inserted in the iVT3**. This enables safe telephone calls and alarms even without cyclic battery changes and even if the mains supply has been switched off. A loudspeaker can be connected to the telephone for loud distribution of the ringing signal tone in noisy areas. Volume control for handset (listening and speaking) and loudspeaker.